Rare earth 60 lb. 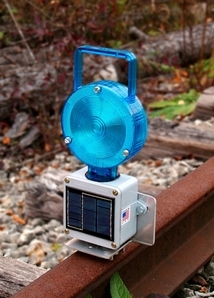 pull magnet keeps lantern secure on top of rail. Brilliant 4 LED flashing blue light operates up to 22 nights on full battery charge. Lantern must be used in upright position. Light turns off when lantern is titled 45 degrees or more. To re-charge, solar panel must face up towards sky.